Ubud Monkey Forest in Bali, near the town of Ubud, consists of three 11th-century Balinese Hindu temples on 27 acres dedicated to (again) monkeys. 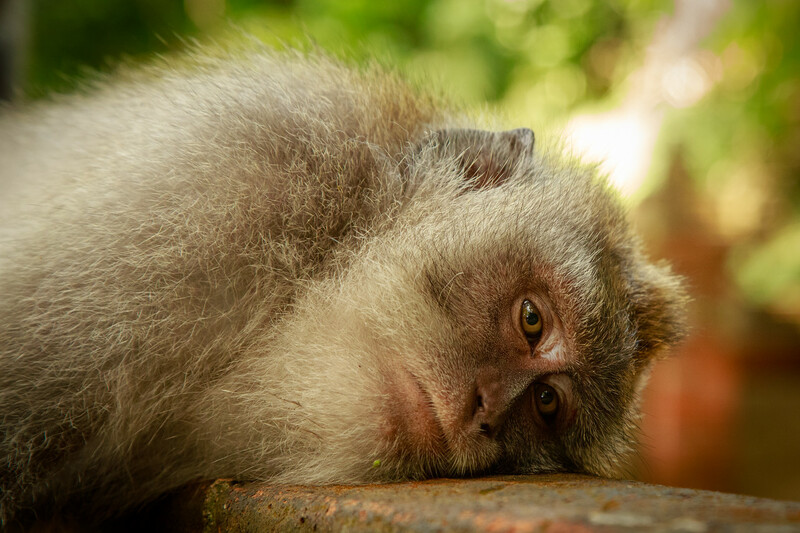 Around 600 of these sassy simians, monkeys otherwise known as Balinese macaques, live in two distinct troops known as matrilines. Like any group of animals that compete for limited land and resources there are sometimes conflicts but for the most part, they manage to coexist peacefully. As with their human cousins, it is not uncommon for some of the male macaques to wander between matrilines in attempt to find mates. Also, like in human societies, parenting styles range from highly permissive to very protective with mothers bearing most of the burden. It is however not uncommon to see females caring for unrelated young and occasionally adult males will take on some of the responsibility. The brochure for the Monkey Forest Sanctuary says, “Both males and females, have set of dominance relationship, but they are not always clear and consistent [sic].” This puzzling sentence is cryptic enough that, in my experience anyway, it also could be used to define human relationships. 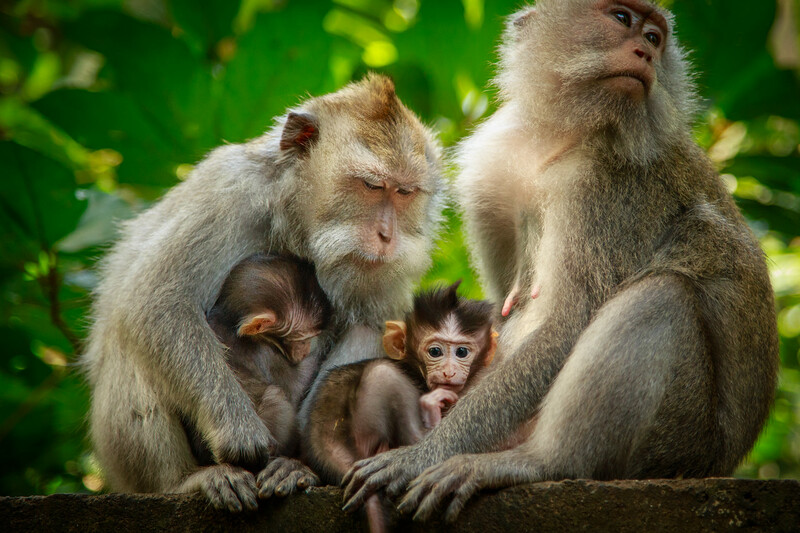 A visit to the Sacred Monkey Forest, known in Balinese as “Mandala Suci Wenara Wana”, would be pleasant even without the monkeys (although the name would be a little weird). Over 155 species of trees shade wide pathways and clear, fast running streams flow through the preserve. The site contains three mossy, fern covered temples are at once mysterious and inviting. Birds and butterflies flitter through shafts of sunlight and the music of cicadas fills the air. In addition to the macaques watching the humans is pretty fun too. There are signs saying, “Don’t Feed the Monkeys” at the entrances and entrepreneurial banana vendors selling monkey snacks right next to them. It is comical to watch as people take fruit out of their bags and the monkeys, sensing a treasure, start climbing up their backs and onto their heads as the visitors attempt to raise the bananas out of reach. If you are staying in Ubud, it’s very easy to walk to the park. It’s located on Jalan Wenara Wana, about a 20-minute walk from Ubud Palace. For those coming from outside Ubud, the easiest way to get there is by taxi or renting a car. Parking is free. Ubud is roughly a 1.5 – 2-hour drive from the main coastal resorts. Although there are many sellers outside the park selling bananas, be very careful bringing any kind of food into the park. 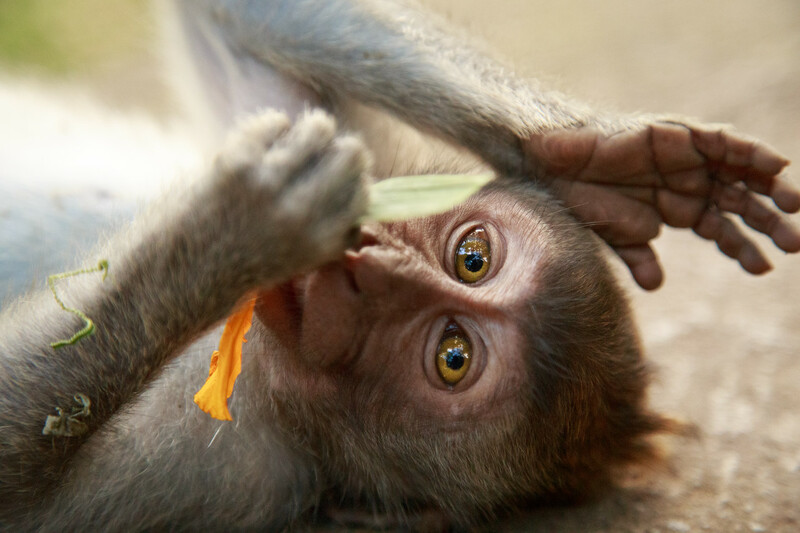 Monkeys have a very keen sense of smell. They will find any food hidden in your pockets or bags. Be careful with wearing sunglasses, jewelry and hats. The monkeys find them very attractive. Don’t go too close to the monkeys with your camera. They may feel threatened and possibly attack. If a monkey jumps on you, don’t panic or try and push it off. Remain calm, it will be ok. There are many park rangers around if monkeys get too frisky. Remember, even though the monkeys look really cute and they are, they are still wild animals. Your photos are incredible Jonathan as always. 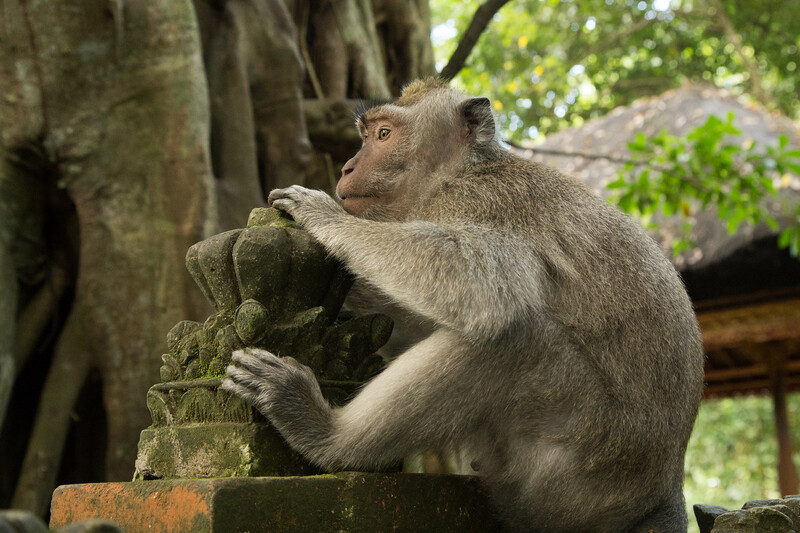 I have been to the Monkey Forest many times over the years and have seen them stealing all manner of things from people. I have also seen people get bitten and scared out of their minds when one of the big ones comes down in defense of a snatched water bottle.